The story in one sentence: A pilot saves almost all of the passengers of a malfunctioning airlplane, and even though the malfunction not his fault he might have to go to jail for life. 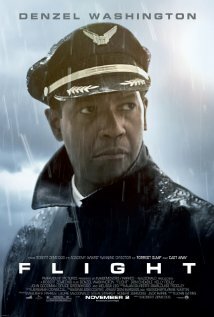 Storyline: Pilot Whip Whitaker (Denzel Washington) is an alcoholic who has lied his whole life about his addiction which even caused his marriage to fail. One day – a day like every other day – his plane shows a malfunction and he has to perform a forced landing. Instead of 102 people only 6 have to die, and Whitaker becomes a hero. But when his blood test from the day of the events shows that he was not only drunk but also high on cocaine, he has to face the truth he has been trying to hide for so long. Review: This movie proves that you don’t need a lot of gore to keep you on the edge of your seat. The scene of the forced landing was probably the most intense I have seen in a while, I even caught myself screaming. The cinematography is amazing during this whole scene and the various detailed shots of the instruments and the close-ups of the passengers’ and crew members’ emotions makes you almost a part of it. Denzel Washington is brilliant and gives us a very complex portrait of a man who has fallen hard but won’t admit to it. At times I felt sorry for him, then I got upset. This movie definitely brings out mixed emotions and makes you think hard. Even though they claim in the movie trailer that it was inspired by true events, it really wasn’t. The truth is, there was a similar forced landing situation a few years ago, however, this has nothing to do with the story of the movie. In the middle it gets a little boring but closer to the end the tension raises again and you get a very impressive resolution. Flight is a very emotional drama about a man who almost gave up on himself. The East Trailer – They are NOT playing! !